In Brief:Taking a closer look at the groundbreaking Lumix FZ2500 superzoom camera. For wildlife shooters the 480mm maximum focal length of the FZ2500 offers the capability of getting very close shots without having to haul out a DSLR and a long telephoto lens--and that's quite a tempting consideration. The sharpness of the Leica lens is very impressive and so is the camera's 5-axis stabilization. 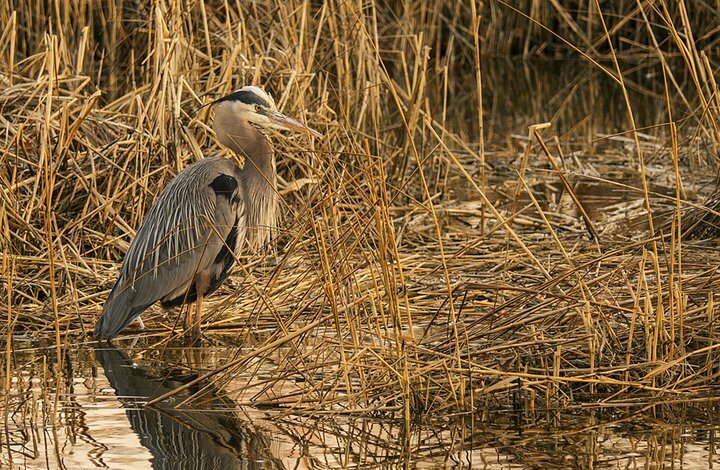 The mallard was shot at 1/160 second at f/10; the great blue heron was shot at 1/80 second at f5, both at ISO 200 and both were handheld. Video recording: DCI/Cinema 4K, 4096 x 2160; UHD 4K, 3840 x 2160; Full HD. It’s hard to deny the allure of the superzoom (aka “bridge”) camera. Here, in one relatively compact body, you have almost all of the technical capabilities of a much bulkier DSLR and without the necessity of carrying a shoulder bag stuffed heavy and expensive lenses. In addition, virtually all high-end zoom cameras offer the exact same exposure, metering, recording, and at least some of the video options, found in the best DSLRs. Many superzoom cameras also offer focal-length ranges that exceed a lot of what still shooters have in their gear collections. 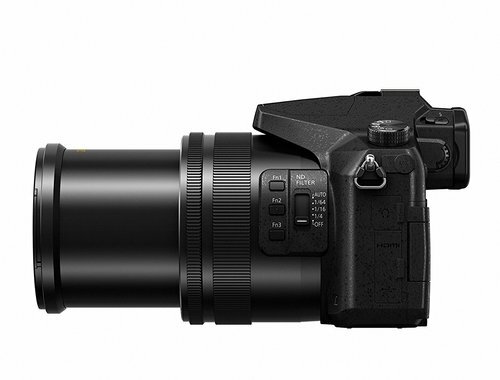 (The soon-to-be-released Panasonic Lumix DMC-FZ80 has a 20-1200mm lens!) When you add up all of these advantages, the temptation to put your lenses (not to mention your shoulder bag) up on Ebay becomes almost irresistible. It's really hard not to be impressed by the scope of the FZ2500's 24-480mm zoom lens range. 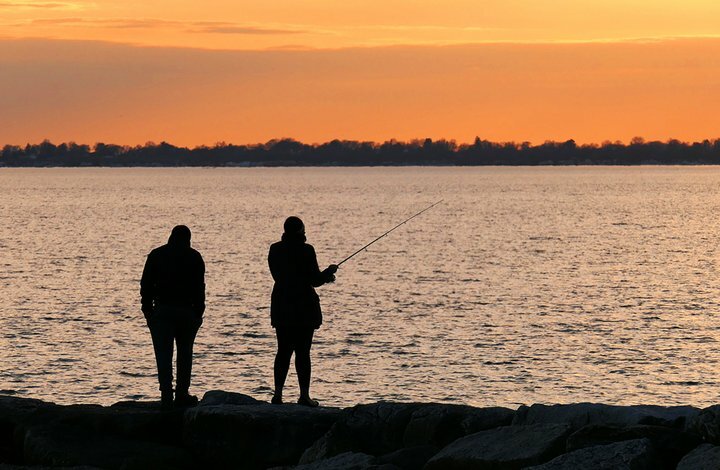 Both shots of this couple fishing at sunset on Long Island Sound were taken from the exact same position. While it's a bit on the bulky side compared to some other superzoom cameras, it's actually a well-balanced and comfortable camera to use. I think this is an ideal travel/vacation camera because not only does it produce stellar still shots, but it's 4k video and some of the video features (like controlled zoom speed and a dolly-zoom effect) will let you create very professional-looking motion pictures. Battery life is above par, too. Top shot was made at 1/60 second at f/9, 24mm and the bottom was shot at 1/200 second at f/10, both at ISO 200. Both were captured in RAW mode in the program mode with +1-stop of exposure compensation. The FZ2500 has an awesome zoom lens. For someone like myself that shoots both landscapes and wildlife, the most obvious attraction of the FZ2500, of course, is the built-in Leica zoom lens that has equivalent of a 24-480mm lens. That is quite a range to have without ever having to reach into a camera bag (or massage a shoulder). That focal-length coverage is surely enough to satisfy most everyday photo needs and it’s more than enough for most vacation shooting. But is it sharp? Yes, it’s very sharp. It may not be as sharp edge-to-edge as some of my stand-alone zoom lenses (and who would expect it to be? ), but considering the zoom range, it’s very impressive. 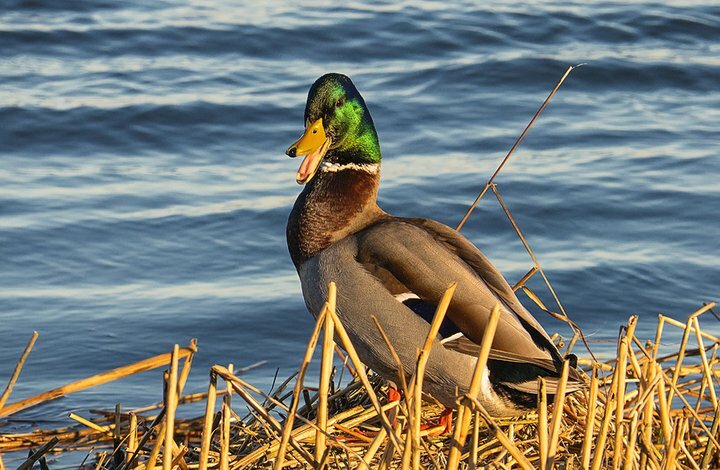 I shot hundreds of frames of ducks, swans and landscape scenes—many with the lens maxed out 480mm—and most of the shots are impressively sharp (take a look at the mallard shot above). Also, with a maximum aperture range of f/2.8 to 4.5, this is a very fast lens even full out. AF options galore. As with most DSLR cameras, you can choose from several modes including the full 49-area AF mode that covers the entire field, or one of several area-specific options (center, horizontal line, vertical line, etc.). There are also a lot of customization focus options available. For example, you can drag you finger to select the exact area want in a “Z” shape across the LCD. Even more fun, if you select the single-area mode, you can then use your fingers on the touch screen (or alternately use a control dial) to expand or pinch that area to make it smaller. Additionally, as you look through the main viewfinder you can user your finger to drag the focus indicator on the LCD—which is how I selected focus areas virtually all of the time. Exposures even in difficult situations like this shot of the Port Jeff Ferry heading toward the Connecticut shore at twilight were nearly always perfect. I shot this with the zoom at 480mm while resting my elbows on the hood of my car. Exposure was 1/50 second at f/4.5 (the widest aperture at that zoom setting), ISO 200. Exposing the full Monty. The Lumix FZ2500 offers all of the exposure and format options that you find in a micro 4/3 or DSLR camera, including full-manual exposure, aperture and shutter priority and both RAW and jpeg recording, as well as 4k video recording. If you’re not in the mood to make a lot of exposure decisions (or if you’re new to photography), the FZ2500 is capable of being just as simple to operate as a point-and-shoot. I handed the camera to my friend Donna at the river one day and she got several great shots without ever having seen the camera before. A world of customization. Panasonic has done a great job iof providing customization options with the FZ2500. In addition to having (if I counted correctly) a total of seven custom-function buttons, you can also re-assign virtually every dial on the camera to another function. More importantly those buttons are extremely well placed and the menus for setting up customization are simple and lavishly illustrated right in the camera. By the way if you’d like to learn a lot more about how this camera operates, I came across a fantastic series of tutorials by a Scottish gent named Flip Calhoon on Youtube who has more than 20 videos that will walk you through the vast labyrinth of setting options and then some. Another cool feature: the lens has built-in ND (neutral density: two, four and six stops) filters so that you can use larger aperture for shallow depth of field, or slower shutter speeds (in both still and video) to change the look of motion subjects. The video system also supports post-focus mode (and 8mp stills from video), so that you can, for instance, shoot using the 49 AF area mode (the camera then creates an MP4 file) so you can choose the frames you want later and use focus-stacking software to combine those frames and get nearly infinite depth of field in stills. Also, there is a dedicated video-settings mode so that the camera can remember both still and video shooting options/customization separately. If you never used this camera to shoot stills, you’d still love it. While I haven’t yet reached Nirvana with a superzoom camera (how about 12-2000mm? ), I have to say that Panasonic is (pun intended) bridging the gap between my dreams and hardware reality quite a bit with the FZ2500. The combination of a super flexible stills camera and a truly worthy video machine make this a hard camera to ignore. The price (around $1100) is reasonable for all that you get, but I am mindful that you can get a very good Micro 4/3 or DSLR camera and one or two zooms for that price. On the downside, this FZ2500 has no weatherproofing. You can’t stand out in the rain with the FZ2500 and that’s something that I hope they’ll conquer in the next generation. Let’s face it, weatherproofing should no longer be an option. Also, importantly, there is the high ISO noise issue of using a 1” sensor. At speeds up to ISO 800, the noise levels are fine, but at ISO 1600 I started noticing more noise that I’d consider acceptable with some (not all) subjects. I also think that for the price, you should get a full printed manual in the box instead of just the basic guide (you can download a pdf of the full manual here). C’mon Panasonic, $1100, include the complete manual—and some video tutorials! Those few issues aside, however, this is a formidable camera and I would think that for someone who wants a great stills and video camera for travel or for chasing the kids around a park or shooting school sports, this camera is very hard to ignore. And even for pros who like to shoot on their day off, as I said at the outset, it’s hard to resist the allure of such a great one-stop camera. Now, I wonder how much I can get for a used shoulder bag? 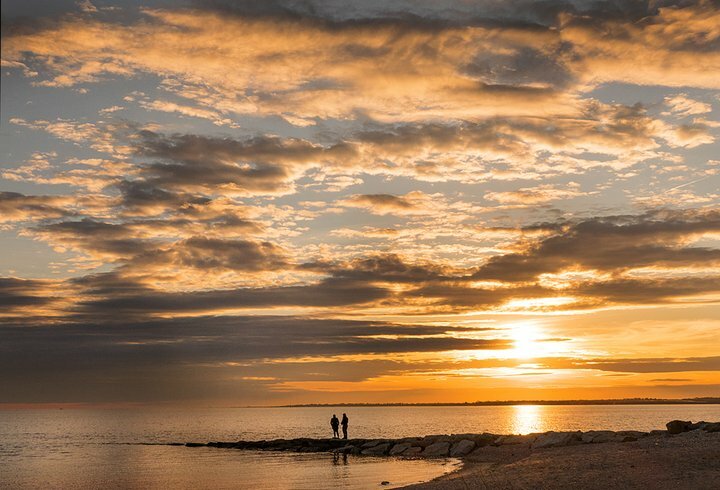 Donna Caporaso commented on: March 30, 2017 at 8:10 p.m.
Great review and photos as always Jeff. 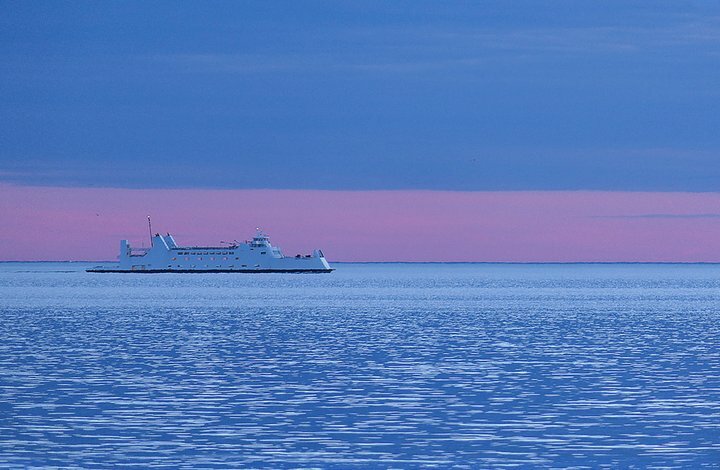 The shot of the Port Jeff Ferry coming in is incredible! It had to be a quarter mile out no? And while I only took a few shots with the camera I would love to have it as a back up to when I don't want to lug my DSLR around. Jeff Wignall commented on: March 31, 2017 at 3:49 p.m.
Ray Rondon commented on: April 22, 2017 at 11:25 a.m.